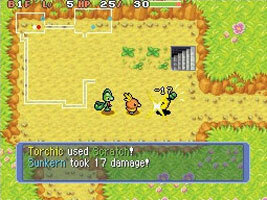 Chunsoft's Mystery Dungeon series has been running for many years, and now it has teamed up with the Pokémon series to put a whole new twist on the world. You start as a Pokémon (determined by questions) and you receive mini-missions from other Pokémon. These will require you to head underground into randomly generated dungeons. Fight enemies in real time and build your stats so you can take on stronger enemies. You may be joined by other Pokémon that help you fight. You can also trade information with the Game Boy Advance version by putting it in the GBA slot on the Nintendo DS.